At Wild-Side we photograph and license images of small domestic animals for display on retail products, for a range of international licensors. 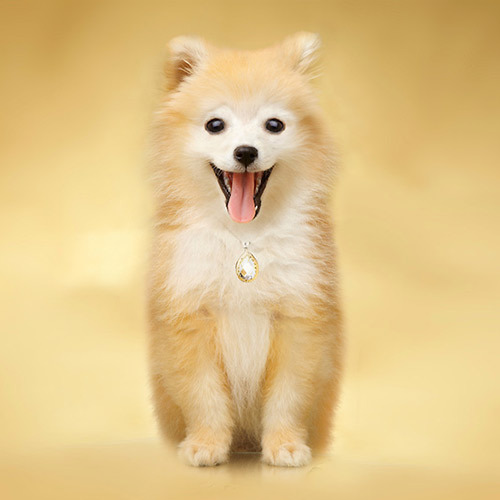 We needed images of a Pomeranian puppy for use in the USA, right at the beginning of 2012, when pups were really hard to find. The brief was for a golden pup, which made it even more difficult. 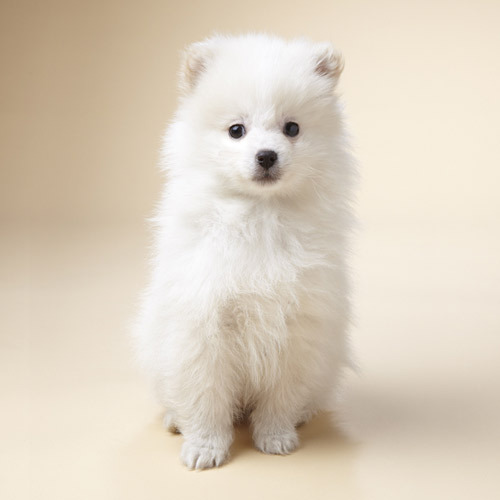 We found an adorable white Pom pup, with the perfect temperament, but we knew from experience that even Photoshop was not really going to help us here. Then a moment of inspiration! If anyone could help us it would be Svetlana and Pet Universe. We purchased the pup and within a week he was a beautiful golden colour and perfectly groomed. He looked fantastic, a star in the making! Job done, with no stress for either puppy or us. 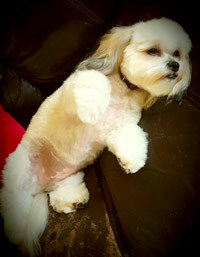 Now Teddy is back to his beautiful white original coat and he is now a permanent member of our family. This spring he will be photographed again, with a new look. Where will he be going for this, Pet Universe of course! The “aging effect” that occurs in pets as they grow older leads to among other things – graying hair, a loss of luster and a change in the coat colour. As result of which the beautiful coloring that was originally a feature of the pet’s coat is lost. The Pet Esthé Colour Restoration System is a revolutionary new pet rejuvenation esthetic product that works to restore the original colouring of coat that faded due to such things as aging and ultraviolet rays, bringing out to the maximum the pet’s natural charm and maintaining its youthful apperance. In human esthetics technology, the skin treatment means rejuvenating the skin condition such as rejuvenating the skin, removing crow’s feet, and whitening the skin. 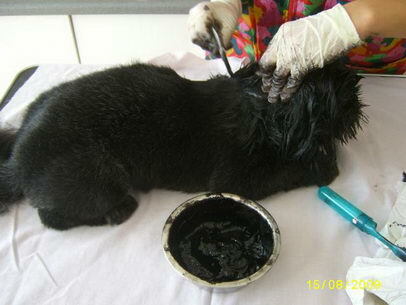 In pets, the skin is hidden under the coat, so even if the skin condition is improved, the pet does not look rejuvenated. 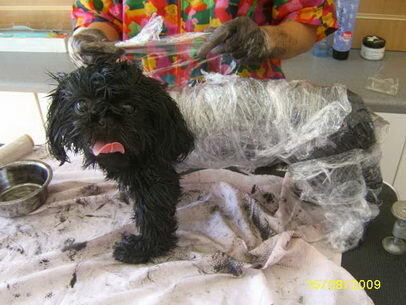 Pets cannot be rejuvenated without rejuvenating their coats. This is the difference between pets and humans. Of course, the hidden skin is also very important, so with products from the Pet Esthé Special Care System, we aim to rejuvenate the coat and the skin at the same time. General pet rejuvenation is administered in combination with number of separate treatments such as Colour Restoration System, Aromatherapy System, and Thalassotherapy System. Took my two stray cats to see Svetlana, Batty (about 9) would not let me comb his knots or touch his hind quarters at all but, Svetlana has a wonderfull way with cats and dogs and soon had him iin the bath and covered in soap suds! He looks lovely now and not a knot in sight ! Billy, my other boy is 18 and getting very frail, as with older cats his fur was becoming knotty and I believe not keeping him warm any more. After being groomed and given a nice warm soapy bath he now looks like kitten again and smells oh so sweet. A huge Thank you to you and your team Svetlana I am so glad I found you. !!! As you did such a fantastic job with Peg last year, we had absolutely no hesitation in inviting you back to care for her again this year. She is so much happier once more, and loves her new hair-do! 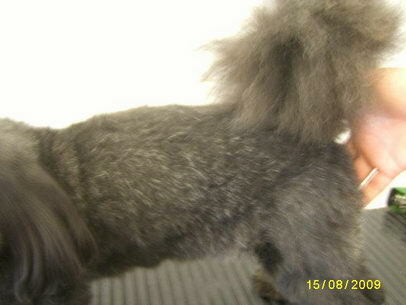 Her twin sister Meep also looks fabulous after her nail-clip and grooming session. They both say thank-you, as do we!!! All the advice you gave on which brushes to use and how to groom them both properly was invaluable. You’re an absolute star! You came to see Peg last night to get rid of some of that awful matting in her fur. I just wanted to say a big Thank You – she is so happy today and loves her new hairstyle. Like you said – her sister Meep does not recognise her so a lot of hissing going on – she doesn’t recognise her new perfume either. Am sure they will sort it out. I would like to say a Huge Thank You for taking care of my Bischon Chany today! Becouse we didnt groom her for long time it must have been a hard job for you,the result was brilliant, she looks soo cute and nicely groomed!!! Thank you also for helping to arrange a pick up for Chany and the pink lead! You are the BEST! We’ll see you in 6 weeks!!! Thank you and your team!!! 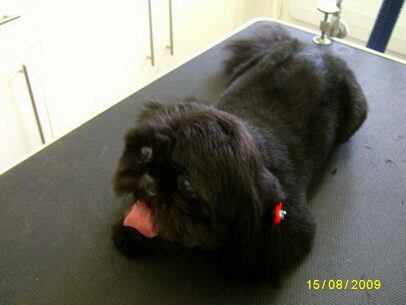 My beautiful Bella back from Pet Universe all groomed and smelling lovely.